HTC Vive controllers are used in combination with [insert max for live osc plugin name] to take incoming Open Sound Control (OSC) signals from the controllers positional information, and is then routed into two audio Oscillators. 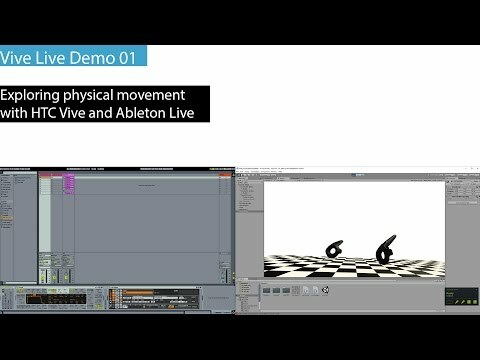 You will need a computer with Unity3D, Ableton Live, Max for Live, and Ethno Tekh’s ‘Tekh Map’ Max for Live devices installed. Open the repository in Unity. Look at the Live Sessions folder for the associated Ableton Live project. Currently the IP address of the sending computer is hard coded to localhost (127.0.0.1). This means it will not by default send OSC signals to another computer. This can be changed in OSCHandler.cs and edit the address in the Init function. /vc1/x floating point number, no bounds as yet. Relative to the middle position in the SteamVR tracked environment. /vc1/y floating point number, no bounds as yet. Relative to the middle position in the SteamVR tracked environment. /vc1/z floating point number, no bounds as yet. Relative to the middle position in the SteamVR tracked environment. /vc2/x floating point number, no bounds as yet. Relative to the middle position in the SteamVR tracked environment. /vc2/y floating point number, no bounds as yet. Relative to the middle position in the SteamVR tracked environment. /vc2/z floating point number, no bounds as yet. Relative to the middle position in the SteamVR tracked environment. Ableton Live Project contains two tracks, each containing a simple mono synth patch. Ethno Tekh’s ‘Tekh Map’ Max for Live devices handle routing of the HTC Vive controllers OSC data to each synth. The patches function as rudimentary theremin-esque sound generators.